Truthfully I am a very latecomer to the world of tuna casserole. I mentally classified the dish in the same category as jello salad, spam and tv dinners, all retro food that did not need to make a comeback. 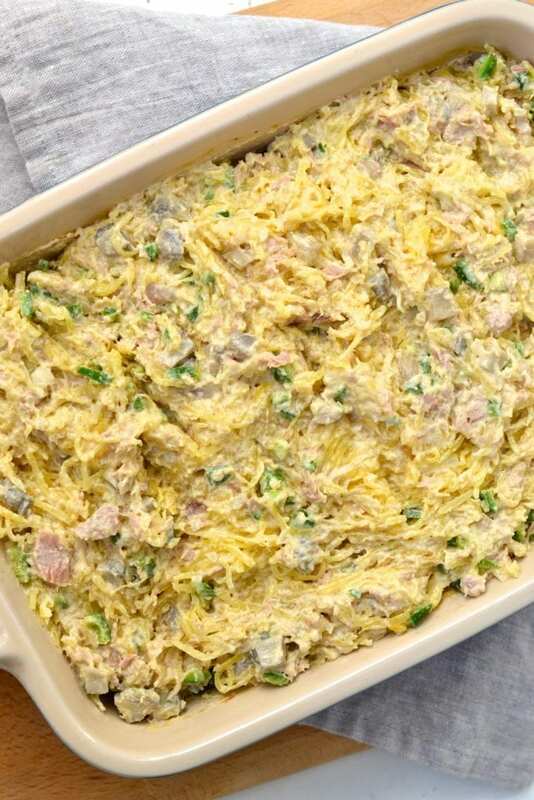 It wasn’t until university when my roommate made her family recipe for classic tuna noodle casserole that my view of the dish completely changed. 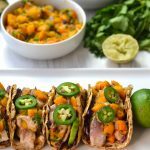 It was comforting, satisfying and so delicious, I was in heaven! 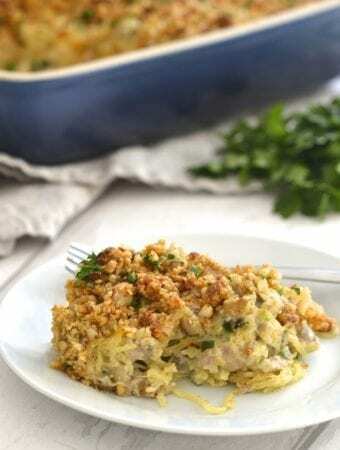 The traditional dish is usually made with egg noodles, cans of cream of mushroom soup or condensed milk and heaps of cheese, so coming up with a dairy and grain free version was quite a challenge. 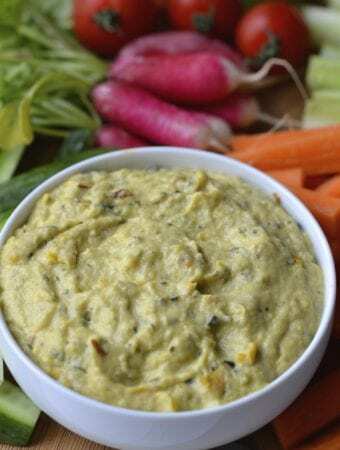 I ended up creating a delicious cashew based cream sauce that I can truly say tastes just like mushroom soup. To cut through the creaminess of the casserole I added in chopped jalapenos for a kick of heat, but if you want to keep it classic and aren’t on Whole30 you can swap them for peas. 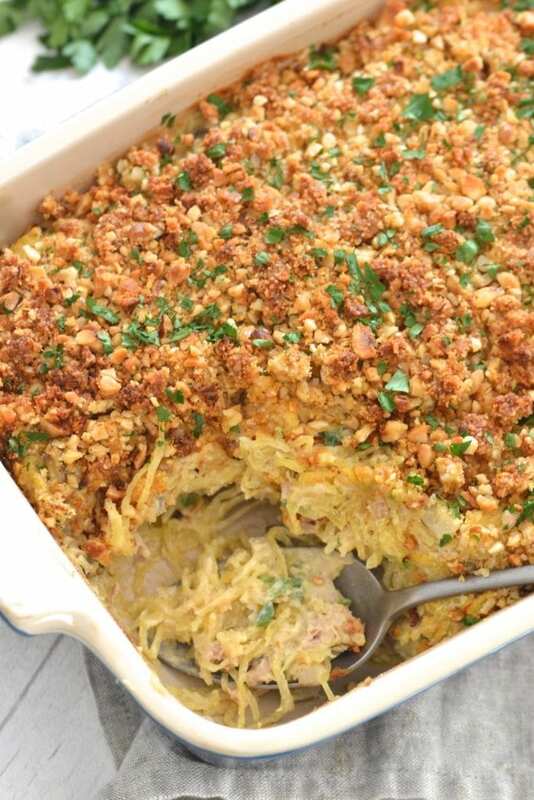 In place of noodles I used spaghetti squash, which works incredibly well in this casserole. The squash strands really do seem just like noodles, and they hold their shape and don’t become mushy once baked in the oven. 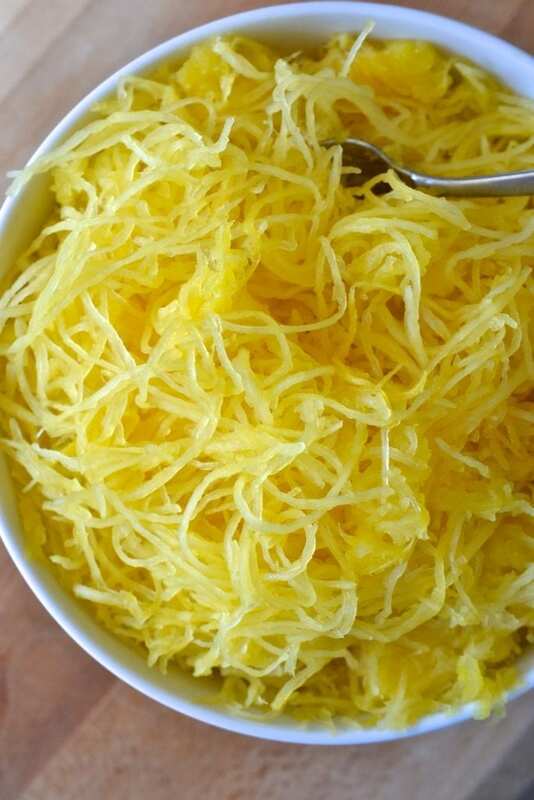 The trick to getting the best noodle like spaghetti squash is to cut the squash in half widthwise, rather then lengthwise. I have found that this method results in much longer strands of “spaghetti” and also requires a lot less cutting, which is a huge win if your knife skills are as terrible as mine. 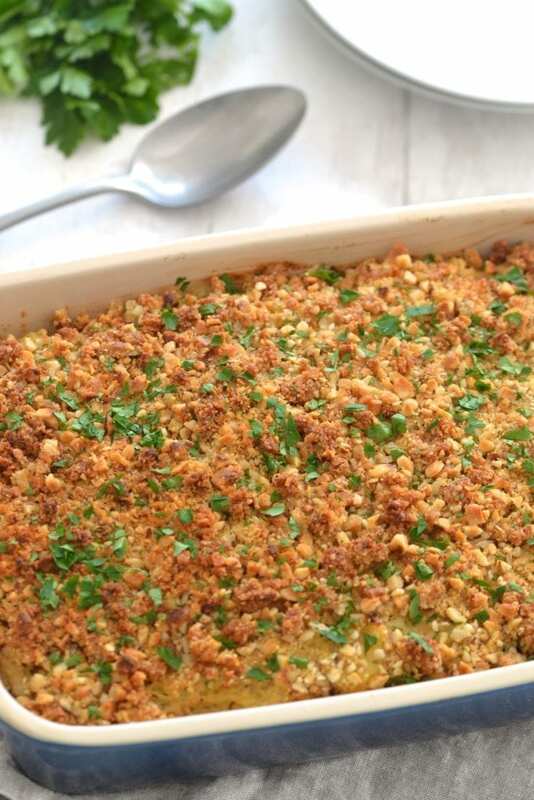 Most tuna casseroles are topped with bread crumbs or cheddar potato chips, so in this recipe I made a brazil nut crumb that gets crunchy when baked. 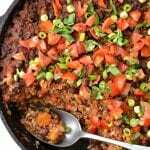 This casserole is so delicious on its own that truthfully the topping isn’t required, but if you want that added crunch then feel free to add it on. 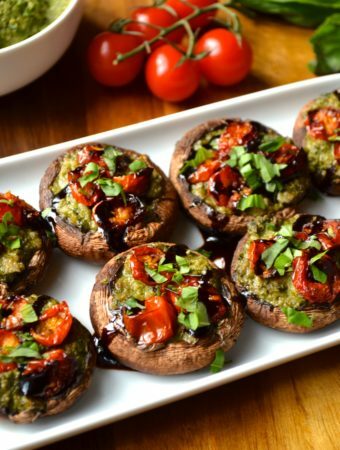 Leftovers will last for a few days in the fridge, or alternatively you can also freeze it. I tested out freezing a small portion of this dish and was impressed with the consistency of the “spaghetti” and creaminess of the sauce once thawed. Using a sharp knife cut the spaghetti squash in half width wise. 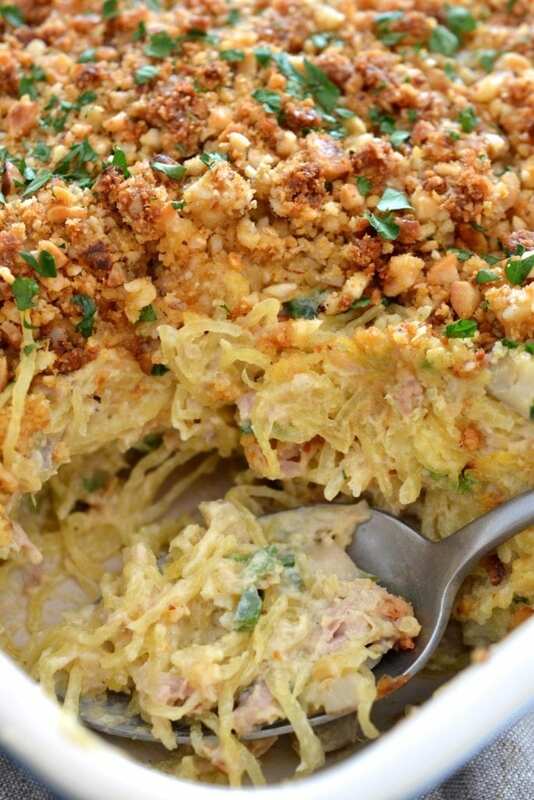 Scoop out the seeds and place the spaghetti squash cut side down on a baking sheet. 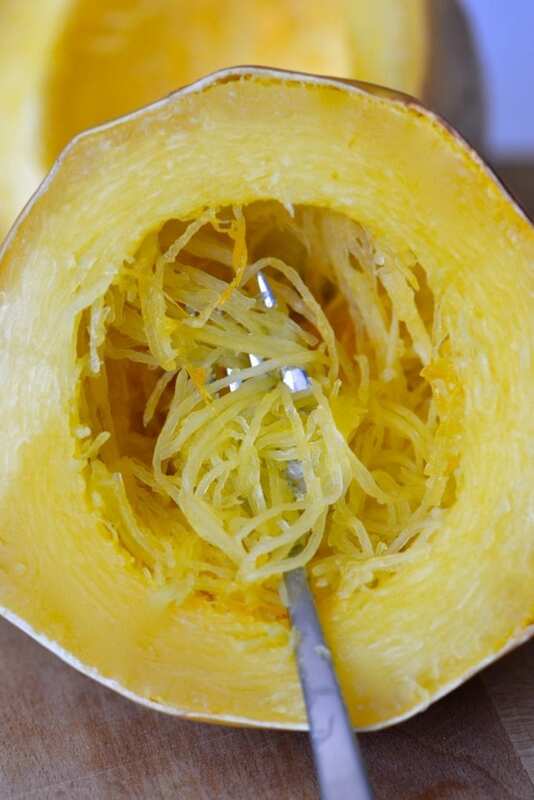 Bake the spaghetti squash for 30-35 minutes until the skin of the squash can easily be pierced with a fork. Allow to cool slightly before pulling the squash into strands using a fork. In a high speed blender combined the drained cashews, nutritional yeast, almond milk and stock. Blend until completely smooth. Melt the coconut oil in a skillet on medium heat. Add in the minced garlic and onion and sautee for 4-5 minutes until the onion has softened. Add in the mushrooms, sprinkle with salt and continue to cook for another 5 minutes until the mushrooms are golden and soft. 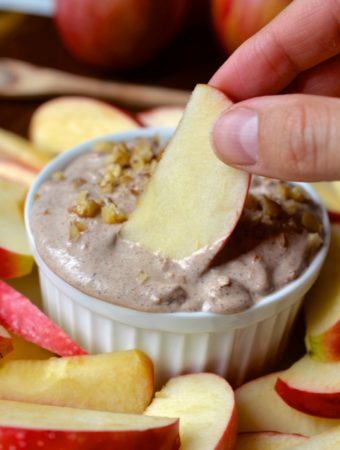 Pour the cashew cream mixture into the pan and stir. Remove from the heat before stirring in the chopped jalapeños and tuna. 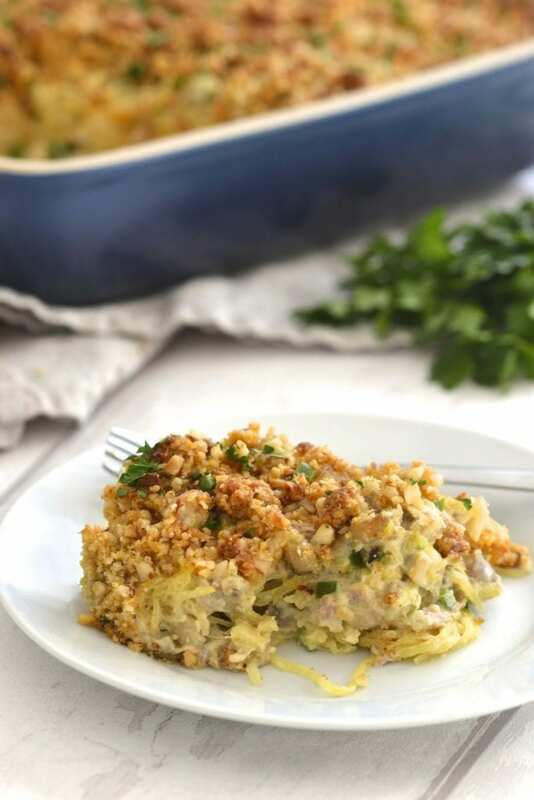 In a baking dish combine the spaghetti squash noodles and sauce mixture, and stir so that the noodles are well coated. 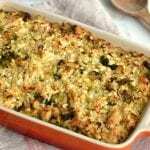 Add the optional crunchy topping before baking in the oven for 10 minutes until the top of the casserole is golden in colour. 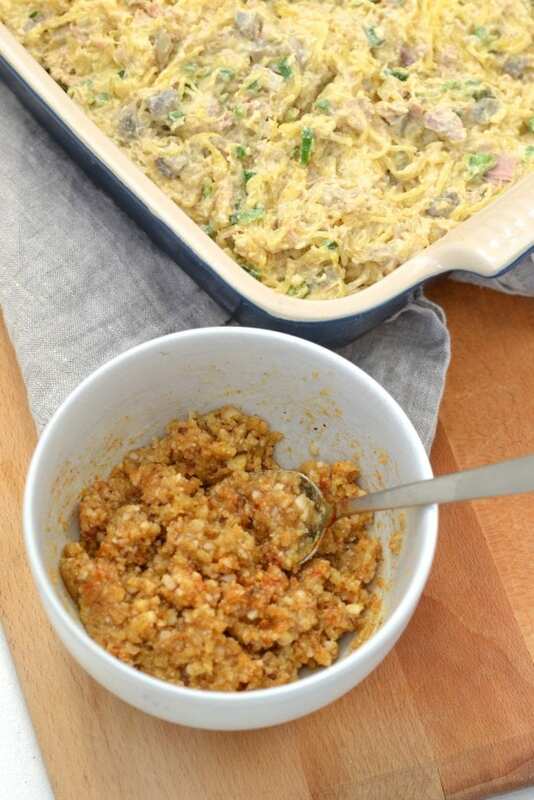 In a food processor combine the brazil nuts and nutritional yeast and pulse until broken into a fine crumbly texture. 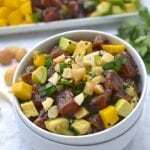 Stir in the almond flour and melted ghee or coconut oil. 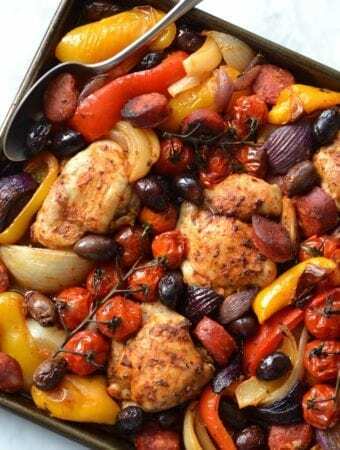 Evenly spread the mixture over the casserole before baking in the oven. 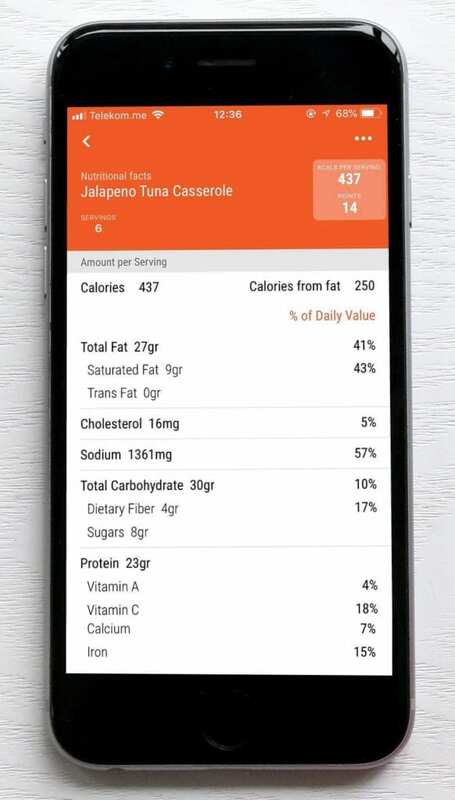 Nutritional information listed below courtesy of RecipeIQ an easy to use free app that’s great for finding out the nutritional information of your favourite recipes. Click here to download the app. I was skeptical about the nutritional yeast but this recipe was AWESOME. 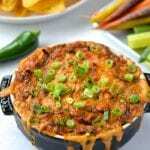 My family loved it and it’s the best Tuna Casserole I’ve had. And it’s healthy. I didn’t need it low carb but I did need it dairy free. 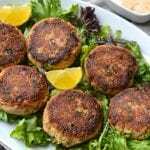 I added peas to this recipe and doubled the tuna. This was so awesome. I used almonds instead of cashews. Will definitely be making this again!! Thank you!! I’m so happy that it worked with almonds!! Delicious! My husband and I truly enjoyed this! Thanks for sharing! Awesome! I’m so happy you enjoyed it! AMAZING! 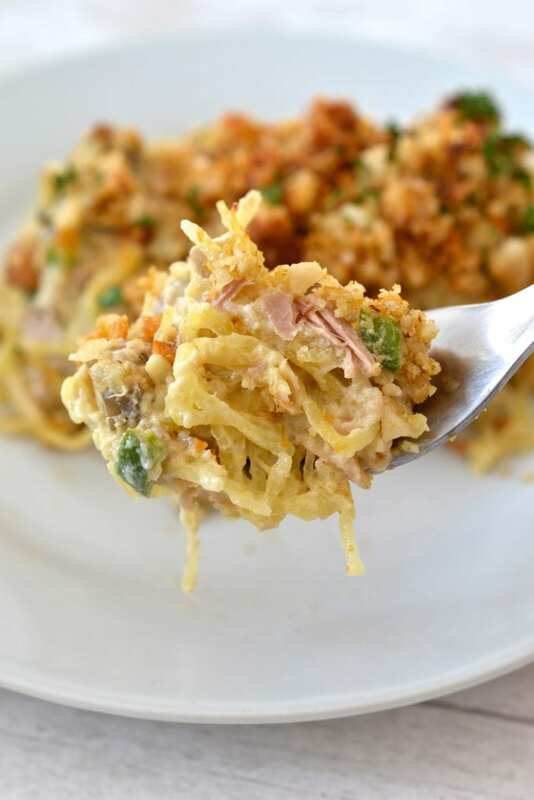 I typically don’t eat canned tuna and this dish is soooo good! Thanks for sharing and never disappointing! Yeess! So happy to hear you enjoyed it! 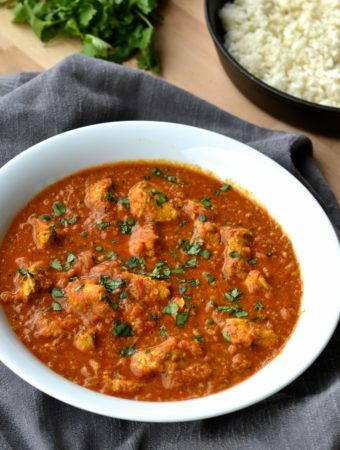 Is there something else I can use instead of Cashews? Yea!! Your comment totally made my day! SO happy that you enjoyed it!